I'd better start by explaining, for those of you over 23 years of age, that Groovin' the Moo is Australia's premier regional music event. Australian and international artists appear at six different regional venues over three weekends, from Townsville to Bunbury. So what was I doing there? 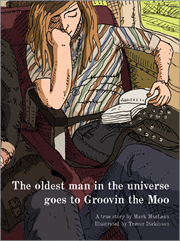 Gonzo short story The Oldest Man in the Universe Goes to Groovin the Moo was inspired by a train journey to Maitland to re-enact my vibrant rock'n'roll youth. It features illustrations by Swindon cartooning legend Trevor Dickinson. Find out more about Five Boxes, A Year Down the Drain, The New Landscape or A Short History of Ireleth & Askam-in-Furness.